Whew, you guys dodged a bullet there! I have bad sleeping habits (ie, I don’t) and I generally end up writing these posts late at night, way past my bedtime. Last night I wrote a long, somewhat melodramatic post that was brought on by a sad blog I’d found and my overtired brain. It started with reflections on our mortality, moved through worries about my sweet boy ever getting hurt, and finished with some truly saccharine clichés and advice to hug your loved ones while you can. Yeah…that kind of post. It was a little heavy for banana bread, to say the least. Fortunately for ALL of us, my blog was down for a bit, so I couldn’t post it before I went to bed. (Small mercies.) In the light of day it all seems a little…dramatic? cheesy? unrelated to food in any way, shape, or form?…and so you’ll just have to enjoy this banana bread without a side of death talk today. You’re welcome. 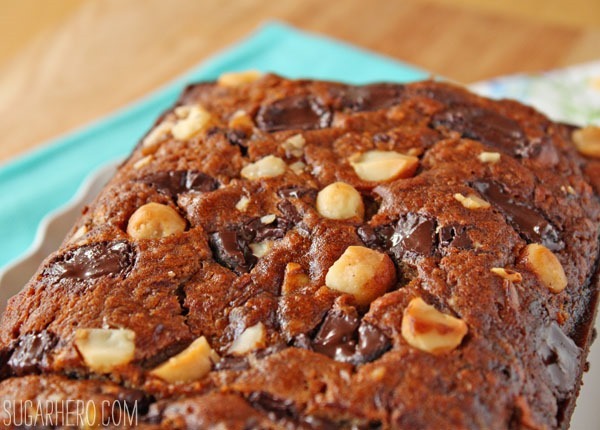 This is comfort food at its most comforting—simple, satisfying, a moist and fragrant banana bread full of big chunks of melted chocolate, salty, buttery macadamia nuts, and large flakes of sweet coconut. I basically took my favorite banana bread recipe, added even more of my favorite things, then ate it all in thick slices over the course of one weekend. As a baking (and life) strategy, it worked out pretty darn well. 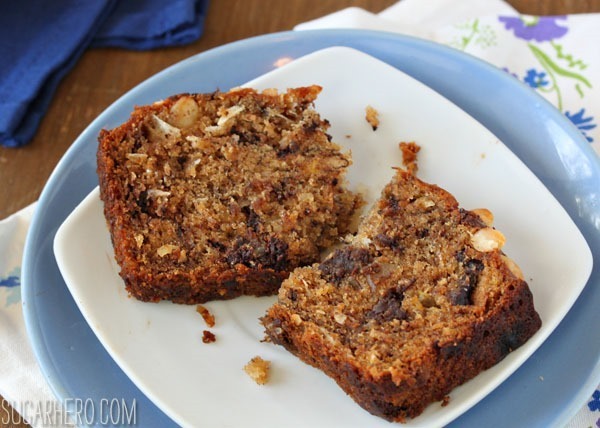 If you’re usually a banana bread purist, I really hope you’ll give this a try. Regular banana bread is great, but when you add some textural contrast and tropical flavors, it’s even better. And chocolate. Who could be mad at the addition of chocolate? I usually eat this bread plain, but it also takes nicely to toasting (why hello, hidden pockets of melted chocolate! ), and can you imagine warm, freshly toasted pieces slathered in coconut butter? Yes please. And of course, you can omit or make substitutions for the coconut or nuts to suit your taste. 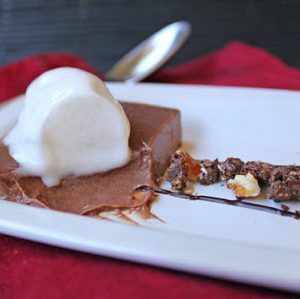 I’m thinking hazelnuts or almonds would be great additions, and if you go the hazelnut route, you know you’re required to top a few slices with Nutella, right? It’s hard to go wrong and easy to get right, so let’s do this thing! 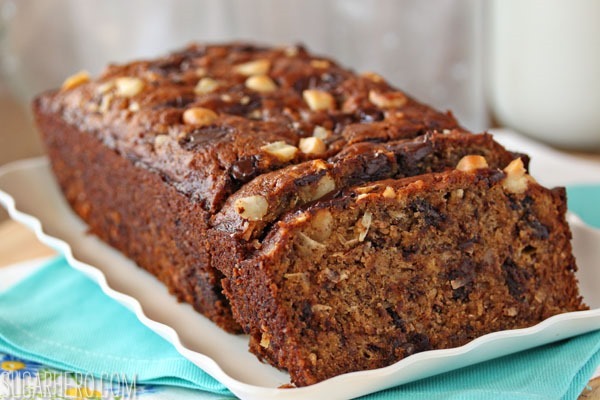 This Banana Coconut Macadamia Nut Bread is a comfort food at its best. 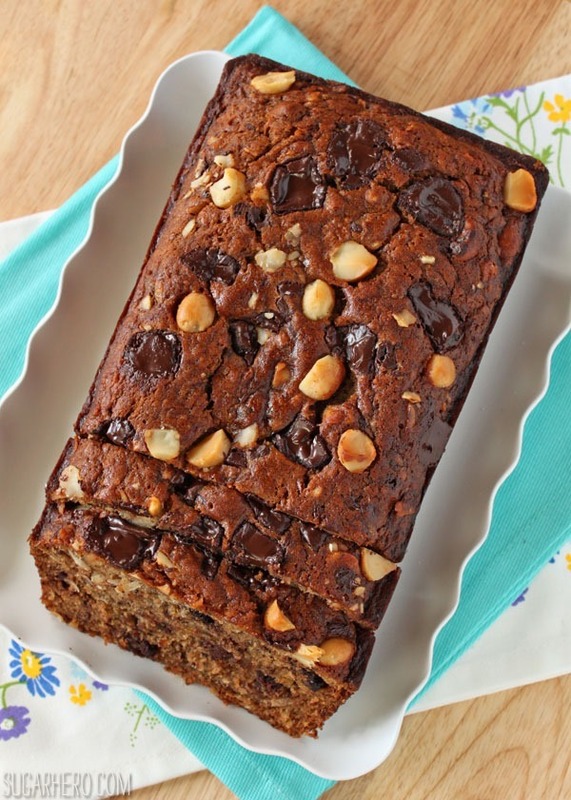 It's simple, satisfying and fragrant banana bread full of big chunks of melted chocolate, salty, buttery macadamia nuts and large flakes of sweet coconut. Preheat your oven to 350 F, and spray a 9x5-inch loaf pan with nonstick cooking spray. In a medium bowl, whisk together the mashed bananas, sugars, coconut oil, milk, egg, and vanilla. In a separate large bowl, whisk together the flour, baking soda, salt, and cinnamon. Pour the wet ingredients into the dry ingredients, and blend well with a spatula, just until the streaks of flour remain. The batter will not be smooth. 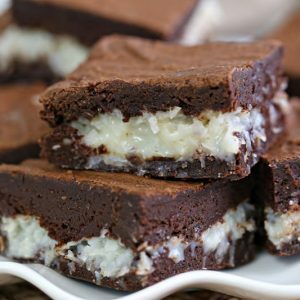 Add most of the chocolate chunks, macadamia nuts, and coconut flakes, reserving a handful for decoration, and stir well. Pour the batter into the prepared loaf pan, and sprinkle the top with the reserved chocolate, nuts, and coconut. Bake at 350 F for 55-65 minutes. Turn the bread halfway through baking, and cover with a loose tent of foil if the top seems to be getting too dark. The bread is finished when it starts to pull away from the sides of the pan, and a toothpick inserted comes out clean. Cool the pan on a wire rack for about 20 minutes, until it is warm but not hot to the touch, then remove the loaf and let it cool completely before slicing. Oh heavens, I have been there… Thank goodness I usually walk away from a post if I’m unsure of it and come back to it later and laugh at myself. Like, okay D, people are here for food. Calm yoself. That said, I’m sure that even a “MORTALITY, you guys” Sugar Hero post would be wonderful and great. You are good at this! Lastly, this bread looks delightful. I could certainly go through a whole loaf in a weekend, especially if you remind me that life is dangerous and then we die. PS My next blog post is totally just going to say “MORTALITY, you guys!” and then a recipe for cookies. Done! 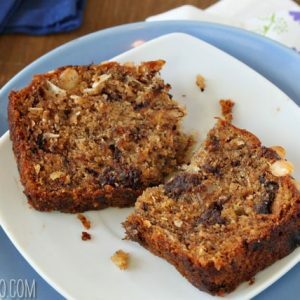 this banana bread looks delicious and combines my favorites- coconut and macadamia nuts! My kind of comfort food for sure! Thanks Samina! Pretty much any food could be improved with some melted chocolate pockets inside. 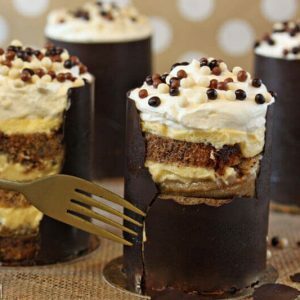 I agree–I don’t know if I can go back to plain banana bread after this! I think that means you need to make another batch with chocolate. 🙂 Glad you enjoyed some banana bread recently too! Anyways I adore this banana bread. It has all my favorite things. Made this today. Only change I made was to adjust flour ratios to incorporate whole wheat in addition to the white. I find the bread oily and wet and did bake it for well over 65 minutes and even allowed it to sit in a warm oven to dry up a bit. My thoughts are that it is ok, a little heavy for my liking. Not sure that I’d make it again.